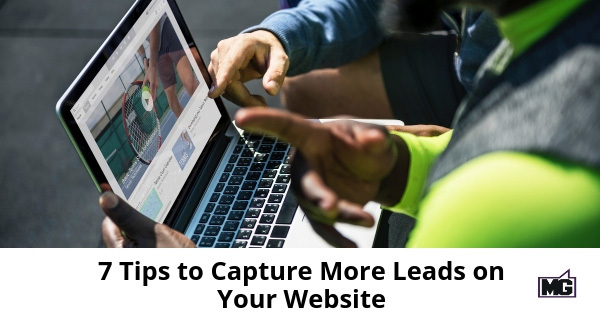 Are you ready for 7 tips to capture more leads on your website? You’ve come to the right place! One of the most critical functions of your organization’s website is to generate leads. You can have the best-written website in the world but, if visitors just read a blog and don’t engage, that’s not good. Customer engagement and converting visitors into leads is the most important function of your online strategy, and your website is just a part of your strategy. Luckily, there are several different ways to increase your leads and turn website visitors into future customers. When reviewing your site it’s important to understand that improving leads is an intricate process and there isn’t one specific solution. Lead generation depends on site design, customer engagement, and testing what draws attention and when to ask for more information. There are several different aspects of your online presence that relate to effective lead generation. Here are 7 tips on how to generate more leads. First things first, to generate leads you need a mobile-friendly website. This might seem basic but it’s critical. Mobile phones are now the most dominant method of accessing the Internet. Data from Pew suggest that smartphone ownership is a large section of the market. Part of lead generation is making sure your customers can access your site without getting frustrated. Sites that aren’t optimized for smartphones or tablets are annoying to use. If a visitor can’t navigate your site they’re not going to become a lead. They will leave. Ensure your site is mobile responsive and works well on all phones, including the latest like the iPhone Xs. As technology improves streaming video is a larger part of the internet experience. Add to this smartphones with sharp screens and fast cellular data, and this trend will only go up. Videos are highly effective because pictures can easily explain what your company does to potential customers. With an article, you hope they read it and more importantly understand it. With a video, you can answer common questions and clarify anything that needs explaining. Videos are useful if your product isn’t easily understood. An informed visitor is more likely to become a potential lead. To get a new email subscriber, give them something of value. A free gift can take many forms and doesn’t have to be physical. A discount coupon on a future purchase or an educational ebook can be enticing to visitors especially if it solves their problems. Ebooks allow you to show off your industry knowledge which further builds consumer trust. When generating leads, live interaction is a highly effective approach. With a live chat, you can ask questions of visitors, clarify information, and collect important profile and contact data. Live chats are easy to use, visitors don’t have to make a time-consuming phone call and are more likely to use them. A quick way to increase lead generation is to put your forms (email signups or information requests) on pages that generate a lot of traffic. Review your analytics and look for pages that get a lot of visitors like popular blog entries. As a result, by putting forms on popular pages you increase the odds people will see them and fill them out. A key reason people don’t sign up for email lists or requests more information is they find a pop-up invasive or distracting. By having a box slowly slide in from the corner of the page as a reader scrolls is much less off-putting. It captures the reader’s attention without the negative reaction pop-ups tend to generate. A visitor who is carefully reading through your blog entries is likely already interested in what you’re offering. A well-placed subscription box at the bottom of your blog lets people subscribe without causing a distraction or being invasive. Together, this combination of implemented tips can help your site have the infrastructure needed to grow an audience and successfully capture leads. Therefore it’s crucial to take time to evaluate against this list and set a plan to get moving on the components you are missing! Need help? Contact me to discuss ways my team can help make this a reality for you!